Posted in Fanboyism on April 8, 2010 at 10:56 pm. 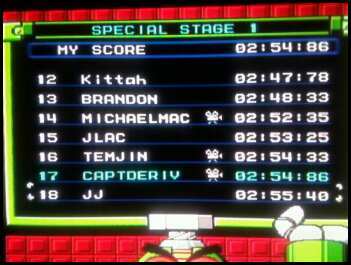 For a brief time in the late afternoon (Eastern time) on Monday, April 5, 2010, I had the world’s seventeenth fastest time on Mega Man 10‘s Special Stage 1. What’s that, you say? “Pics or it didn’t happen“? By around 9 pm that evening, my score had dropped to #30, the very last place on the leaderboard. Since then it’s fallen off completely, and now the bottom spots are dominated by the sorts of times that were at the very top when I was #17. As of this writing, the current #1 spot is over a minute faster than my time. This blog post shall stand as the only persistent record of my accomplishment. What was the secret to my fleeting success? Playing Special Stage 1 many times the day it came out, before the people who have way too much free time on their hands had a chance to fully learn the stage and claim the top spots. It’s easier to rank if everyone you’re competing against is just as new to the stage as you are. If you want to follow my lead, Special Stages 2 and 3 get released on April 26. Rick Astley is pleased with your temporary record too. http://juliasegal.tumblr.com/post/518503473 I think you know what to do with this.